Atlas Prestige is a new structure, established in 2014. It is a comfortable and characteristic Guesthouse located at the base of the Mountain Toubkal. You will love our joyful and welcoming staff which will give special attention to your needs making your stay relaxing and memorable. The Guesthouse is decorated according to the typical Moroccan style with beautiful and colorful carpets and fabrics. It is located in the villages of Achain, at about a 15 minutes walking from the center of Imlil Riad. 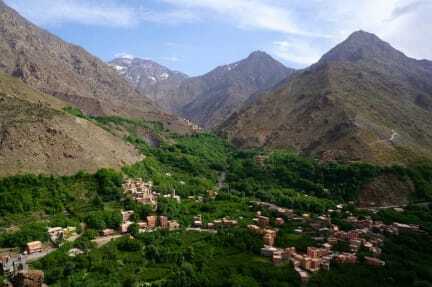 It has been built under the Atlas and Toubkal mountains (the highest mountains in northern Africa), in the center of a Berber village. Marrakesh is only 65 kilometers far from the Guesthouse. The riad Atlas Prestige proposes several rooms with private bathrooms, hither and balcony with an amazing view over the mountain. In common areas, you will also have access to our Free WiFi.